Needed a passport in a hurry. Thought it be best to get professional photos as a failsafe before going down to Her Majesty's Passport Office in Victoria. Paid Snappy Snaps Barnet £8.99. What a big mistake! Photos were rejected on the spot for being too close-up. Thank goodness I didn't need a countersignatory otherwise I would've been totally stuck. Had to pay a further £6 for booth (but not rejected) photos. Despite having receipt and intact useless photos, Snappy Snaps refused refund because I wasn't issued with a 'reject' slip. Never knew this existed as never been in this situation. I have always felt like I am inconveniencing them in this store whenever I ask for anything. 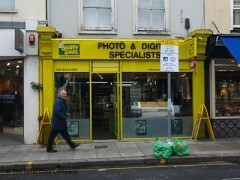 The quality of photos have been fin but the customer services is rather lacking unfortunately. Had some very precious pictures restored not knowing what to expect and was pleasantly surprised.They ranged from filling in an image of a torn section of a picture to removing unsightly backgrounds to restoring a very old image and they came back exactly like the original,if not better.Not cheap. I visited the store for prints from 2 media cards. The store lost the cards and despite the policy being to replace media they only replaced one of the cards and have argued constantly about whose responsibility it is to take care of cards in their possession. Dont use if you value your memory!! !